Grade One students say many remarkable things–some hilarious, some profound, some quite moving. I often wish there was someone else there to hear it. Posted on March 27, 2013 by Skot Caldwell Comments8 Comments on Has Spring Sprung? Hello folks at home! It’s been a little while since I posted anything, so here’s a little update on what we’re up to. I’ve had some nice feedback about the blog from some parents, but am not completely sure how many have seen the thing, or what they are checking out. Are your reading this stuff? Checking the Gallery? Is it helpful? Are you finding your way around? I’d welcome any input you have. I think I have just about figured out how to insert some video, in order to share some of what we are doing with reading as well as other activities. Well, spring finally felt like it had sprung today. Apparently there were about a million geese that flew overhead today, but sadly we missed it. I’m going to start leaving the windows open a crack just so we can hear them if it happens again, and we’ll run outside. Azylynn reminded me of my seasonal responsibility, and so I cranked out another chalk drawing. Spring or not, the Root Children, and the sprouts in the ground, are still waiting to wake up, as is the story from which they come. We had some good questions last week about why Spring is white and cold in Canada, but is green and warm in China, or Greece, or England. With questions like this, I am very comfortable leaving the wonder as wonder. Among the many, many things my wife has taught me about young children is that they often don’t want a great big explanation–what they want is the shared experience of wondering. We have a tendency to over-inform children, denying them the opportunity to consider and explore ideas–sometimes for a long time. At some point, the children will learn about the tilt of the earth and so on, but they don’t really need to know right now. If Galileo had lived in The Information Age, I wonder if he would have bothered pondering the stars. <Spring> and <sprung> are examples of words that don’t follow the suffixing patterns the children have come to expect. (This is why young children quite reasonably say “runned”). Words that change form as they change tense are quite common and normal, reflective of the oral language pre-dating the written. Orestis brought this to our attention last week and so we have begun a collection. I think we will find some interesting patterns in these words. Today, we were looking at the spelling relationships between words–their etymological connections. We were trying to decide how we know whether to use <knew> or <new>, and agreed that the pair of words connected by their <kn> digraph were logically related. Darcy wisely exclaimed, “They’re cousins!” These ones are so close I think I’d call them brothers. We will see others among our homophones that are similar: <blow> is clearly related to <blew> rather than <blue>. These patterns are not just cute; they are real and predictable, and should be helpful. 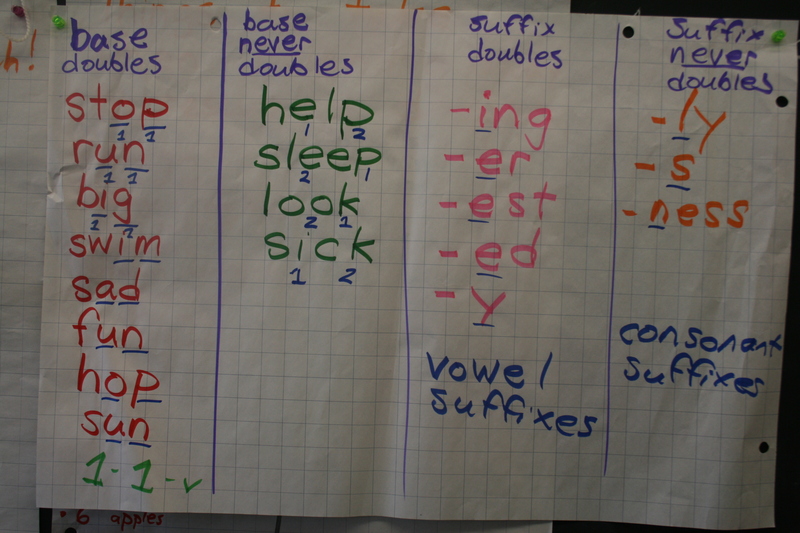 The other pattern we’ve been digging through is when does a suffix cause the final consonant in a word to double? Through our explorations, we seem to have arrived at a 1-1-v pattern: in a word where one vowel comes before one final consonant, that consonant doubles when we add a vowel suffix. Why am I telling you all this? Because you may be like me and didn’t learn a bunch of it in school, and because it will give you something to chat about as you explore words in reading and writing at home. It’s good if we speak the same language, n’est ce pas? 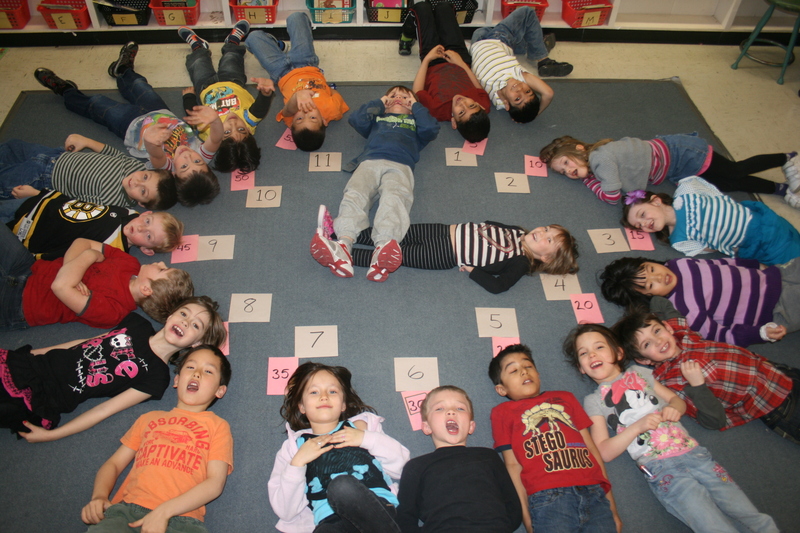 While a six-year-old’s sense of time is appropriately fairly limited (which is why they have no idea how long it takes them to put their coat on, and why rhythm and routine are so vital to their functioning) we have begun to explore clocks. We’ll focus mainly on time to the hour and half hour, but will touch on minutes in increments of 5 (because it doesn’t make sense to me to teach 9:30 without explaining how we got to 30). We’ll also read these times in both analog and digital. We’ll spend a short time on time this week, and then reinforce this skill in practice over the next months. We’ve been working to solidify our “Friends of Ten” addition facts, toward applying it to the addition of larger numbers. Practice with any of this stuff can’t hurt, as long is it is kept pretty relaxed. I will conclude by sharing that we began today with a visit from an older student at our school who has a condition that leaves her without hair. This makes her rather conspicuous and socially vulnerable, and so she has chosen to visit–with her teacher–all the classes to speak openly about this condition and make it easier for the children to see beyond her appearance. I could not have been prouder of our Grade Ones. They listened in utter and heartfelt respect, and agreed that she was very brave to do this. We honoured her with a particularly reverent rendition of our Knight’s Verse, and after she left we had a lovely and mature conversation. Truly, some big thinking to begin the day. Today I was reading a pretty challenging book with Abdul, at the upper edge of his comfort level (this is often where the learning is). We worked through it together, with me encouraging him to apply his various strategies to making sense of text that was unfamiliar. These included spelling the word aloud, finding the base, looking for digraphs, looking at picture clues, thinking about what made sense in context–all things good readers do in Grade One and beyond. Brilliant. I could never have summed it up better than Abdul did in these two statements. When I shared this with the class, everyone knew exactly what he was talking about, including two other students who had to be similarly “brave” themselves (braver than they thought they were) in their reading a little earlier in the day. Of course, by “brave,” we are not (hopefully) dealing with fear–though sometimes this is certainly true–but the basic willingness to try something that is hard, to not avoid or give up. My job, if it is anything, is to help the children feel willing and able to face these dragons, large and small. This includes the capacity to fearlessly look at words and know that they can “take them apart” in various ways. Thanks to these three today for making me feel like I was doing my job.